most women doesn't go crazy about car. and i am actually one of them. when i first bought Becky, of course i am excited! wowww.. i finally have my own vehicle bought with my own moneyyyyy!!!!!! but the excitement is temporary. i never really have the thought of having a car from the beginning. it's my cousin's idea that i should have a car to work. and yes, he's right, having no car is like having no leg for me now. i get used to driving instead of walking. Becky help me moving around a lot for the past few years. but i become selfish and and only thinking about myself and never tried to understand Becky's feeling and need. and because of my ignorant attitude, i often got cheated by other. so, i whatsapp the most trusted person, mr.J, about how much should i pay for tyre pumping. "owhh.. It's rm30. pay it at the counter"
so, i ask the worker at Petronas how much should i pay for tyre pumping there, and he said it's RM25 and he'll help me to pump it. the worker there help me and we had a little chat, and then he said i don't have to pay at the counter, i can just pay to him rm10. he said he's giving me a discount since its my first time. so, i pay him and happily text mr.Jalik telling him that i got discount for tyre pumping. "yeahh, tu orang bagi saya diskaun, dia minta rm10 saja!!" he call me straight after he got my message and told me that pumping tyre is free of charge! "eiii kanapa bah ko tidak kasitau saya awal-awal!!!" "i thought that it might be fun to make you feel humiliate infront of the cashier." that's my stupidity level about car. there's more actually, one time when i went to another car's shop to change my front tyre to the back and my back tyre to the front, since my front tyre punya bunga sikit sudah. the same exact thing happen except that this time, kawan saya di wad lambat reply whastapp so sudah bayar baru reply. ladies, kalau setakat tukar tayar depan to tayar belakang, won't cost you more than rm10 okayy. But the shop actually charge me rm 35.
again, my fault for having zero knowledge about car. i can't remember the shop's name but it's in the Penampang Baru area. worsening the situation, few hours after that i found out that Becky's tyre punctured by small screwdriver. i don't even notice it until my workmate told me about them! thank God i arrived to ward safely with that punctured tyre. 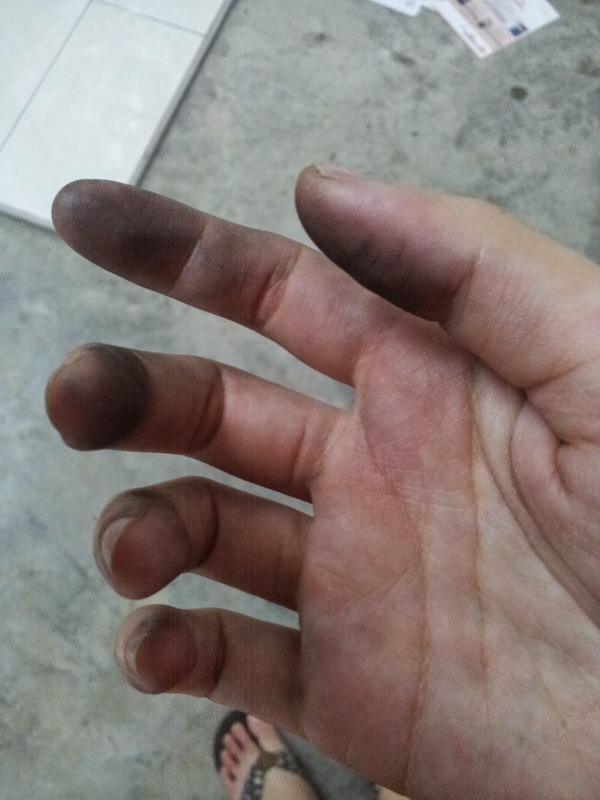 and i am so grateful for my workmate, Raizan, for helping me changing the tyre into the spare tyre. afraid that i might get cheated again, i went to the trusted shop this time, it's the Continental Shop near the hospital and yes, nobody cheat me this time. they charge me only rm 6 for tyre patching. plus the worker are quite friendly compared to the last shop i went. i am in relationship for almost 3 years with Becky now and there's a lot of things that i actually didn't know about him. like how much pressure should i give to Becky's tyre. recently, i learn how to check my car before i went to Kundasang with J's guidance. the trip is at 6.30am so i have to wake up at 5.30am (someone actually made an effort to wake up this early on weekend just to call me and make sure i woke up to check my car's condition. thank for that..keke). i've never done it myself before. and honestly, that is actually the first time i ever felt like i REALLY have my own car. because before this i just know how to drive. if i am from KB usually my father will check it for me. and if i am from KK, no one will do it for me, of course laaaa bah..
i don't even know that i have to check those things before departing!! and oh ya, last time mr.J ask me to buy 'air batery kereta' and i am quite surprise that it was only rm 3.50.
a lot cheaper than my expectation. i expect it to be more than rm50 plus. "tiga ringgit lima puluh sen saja bah"
"air suling saja bah tu. kalau c bapa, dia guna air masak saja tu"
air suling saja pula??? okay, rm3.50 sangat mahal. kbai. i always think that everything about car is expensive, until i got cheated like twice or maybe even more. now more reason for me to learn seriously about car. ladies, i know a lot of us have no passion in car. even though you are still belong to the bank. hahhahahaha.. sy ni paling fail..slalu kna marah sbb basug dlm penjagaan kereta. haha tabah ja la.. sama la kta sherry.. i know nothing about car tp sy sngat suka main game keta lumba.. haha.. mau bljar la jg ni cek keta sndiri2 since sy ada roadtrip hjung mnggu ni p keningau.. hehe..
itulah nama dia basug kan mula2 dulu,, happy lg tu p byr. HAHAHHAHAHAHHA..